Exact figures are unknown. Estimates range from 5,650 to 18,000 POW deaths. When General MacArthur returned to active duty, the latest revision of plans for the defense of the Philippine Islands—called WPO-3—was politically unrealistic, assuming a conflict only involving the United States and Japan, not the combined Axis powers. However, the plan was tactically sound, and its provisions for defense were applicable under any local situation. Under WPO-3, the mission of the Philippine garrison was to hold the entrance to Manila Bay and deny its use to Japanese naval forces. If the enemy prevailed, the Americans were to make every attempt to hold back the Japanese advance while withdrawing to the Bataan Peninsula, which was recognized as the key to the control of Manila Bay. It was to be defended to the "last extremity." General MacArthur assumed command of the Allied army in July 1941 and rejected WPO-3 as defeatist, preferring a more aggressive course of action. He recommended—among other things—a coastal defense strategy that would include the entire archipelago. His recommendations were followed in the plan that was eventually approved. The main force of General Masaharu Homma's 14th Army came ashore at Lingayen Gulf on the morning of December 22. The defenders failed to hold the beaches. By the end of the day, the Japanese had secured most of their objectives and were in position to emerge onto the central plain. Late on the afternoon of the 23rd Wainwright telephoned General MacArthur's headquarters in Manila and informed him that any further defense of the Lingayen beaches was "impracticable." He requested and was given permission to withdraw behind the Agno River. MacArthur decided to abandon his own plan for defense and revert to WPO-3, evacuating President Manuel L. Quezon, High Commissioner Francis B. Sayre, their families, and his own headquarters to Corregidor on the 24th. A rear echelon, headed by the deputy chief of staff, Brig. Gen. Richard J. Marshall, remained behind in Manila to close out the headquarters and to supervise the shipment of supplies and the evacuation of the remaining troops. On December 26 Manila was officially declared an open city and MacArthur's proclamation was published in the newspapers and broadcast over the radio. The Battle of Bataan began January 7, 1942, and continued until April 9, when the USAFFE commander, Maj. Gen. Edward King, Jr., surrendered to Col. Mootoo Nakayama of the 14th Japanese Army. Lieutenant General Masaharu Homma and his staff encountered almost twice as many captives as his reports had estimated, creating an enormous logistical challenge: the transport and movement of over sixty-thousand starved, sick, and debilitated prisoners and over thirty eight thousand equally weakened civilian noncombatants that had been caught up in the battle. He wanted to move prisoners and refugees to the north to get them out of the way of Homma's final assault on Corregidor, but there was simply not enough mechanized transport to move the masses of wounded, sick, and weakened remainder of troops. 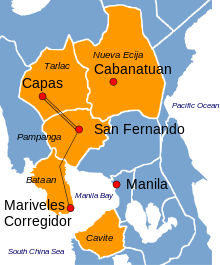 Route of the death march; the section from San Fernando to Capas was by rail cars. Following the surrender of Bataan on April 9, 1942, to the Imperial Japanese Army, prisoners were massed in Mariveles and Bagac town. They pulled us off into a rice paddy and began shaking us down. There [were] about a hundred of us so it took time to get to all of us. Everyone had pulled their pockets wrong side out and laid all their things out in front. They were taking jewelry and doing a lot of slapping. I laid out my New Testament. ... After the shakedown, the Japs took an officer and two enlisted men behind a rice shack and shot them. The men who had been next to them said they had Japanese souvenirs and money. Word quickly spread among the prisoners to conceal or destroy any Japanese money or mementos, as the captors assumed it had been stolen from dead Japanese soldiers. Prisoners started out from Mariveles on April 10, and Bagac on April 11, converging in Pilar, Bataan, and heading north to the San Fernando railhead. At the beginning of capture there were rare instances of kindness by Japanese officers and those Japanese soldiers who spoke English, such as sharing of food and cigarettes and permitting personal possessions to be kept. This was fast followed by unrelenting brutality, theft, and even knocking men's teeth out for gold fillings, as the common Japanese soldier had also suffered in the Battle for Bataan and had nothing but disgust and hatred for his "captives" (Japan did not recognize these people as POWs). The first atrocity—attributed to Colonel Masanobu Tsuji—occurred when approximately 350 to 400 Filipino officers and NCOs under his supervision were summarily executed in the Pantingan River massacre after they had surrendered. Tsuji—acting against General Homma's wishes that the prisoners be transferred peacefully—had issued clandestine orders to Japanese officers to summarily execute all American "captives." Although some Japanese officers ignored the orders, others were receptive to the idea of murdering POWs. During the march, prisoners received little food or water, and many died. Prisoners were subjected to severe physical abuse, including being beaten and tortured. On the march, the "sun treatment" was a common form of torture. Prisoners were forced to sit in sweltering direct sunlight, without helmets or other head covering. Anyone who asked for water was shot dead. Some men were told to strip naked or sit within sight of fresh, cool water. Trucks drove over some of those who fell or succumbed to fatigue, and "cleanup crews" put to death those too weak to continue, though some trucks picked up some of those too fatigued to continue. Some marchers were randomly stabbed by bayonets or beaten. The train consisted of six or seven World War I-era boxcars. ... They packed us in the cars like sardines, so tight you couldn't sit down. Then they shut the door. If you passed out, you couldn't fall down. If someone had to go to the toilet, you went right there where you were. It was close to summer and the weather was hot and humid, hotter than Billy Blazes! We were on the train from early morning to late afternoon without getting out. People died in the railroad cars. Upon arrival at the Capas train station, they were forced to walk the final 14 km (9 mi) to Camp O'Donnell. Even after arriving at Camp O'Donnell, the survivors of the march continued to die at rates of up to several hundred per day, which amounted to a death toll of as many as 20,000 American and Filipino deaths. Most of the dead were buried in mass graves that the Japanese had dug behind the barbed wire surrounding the compound. Of the estimated 80,000 POWs at the march, only 54,000 made it to Camp O'Donnell. The total distance of the march from Mariveles to San Fernando and from Capas to Camp O'Donnell (which ultimately became the U.S. Naval Radio Transmitter Facility in Capas, Tarlac; 1962–1989) is variously reported by differing sources as between 96.6 and 112.0 km (60 and 69.6 mi). The Death March was later judged by an Allied military commission to be a Japanese war crime. Credible sources report widely differing prisoner of war casualties prior to reaching their destination: from 5,000 to 18,000 Filipino deaths and 500 to 650 American deaths during the march. News of the Bataan Death March sparked outrage in the US, as reflected in this propaganda poster. It was not until January 27, 1944, that the U.S. government informed the American public about the march, when it released sworn statements of military officers who had escaped. Shortly thereafter the stories of these officers were featured in a LIFE magazine article. The Bataan Death March and other Japanese actions were used to arouse fury in the United States. These brutal reprisals upon helpless victims evidence the shallow advance from savagery which the Japanese people have made. ... We serve notice upon the Japanese military and political leaders as well as the Japanese people that the future of the Japanese race itself, depends entirely and irrevocably upon their capacity to progress beyond their aboriginal barbaric instincts. 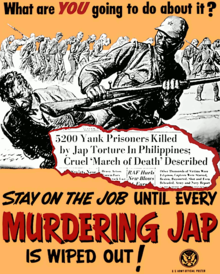 In an attempt to counter the American propaganda value of the march, the Japanese had The Manila Times report that the prisoners were treated humanely and their death rate had to be attributed to the intransigence of the American commanders who did not surrender until the men were on the verge of death. In September 1945, General Masaharu Homma was arrested by Allied troops and indicted for war crimes. Homma was charged with 43 different counts of crimes against humanity. Homma was found guilty of permitting members of his command to commit "brutal atrocities and other high crimes". The general, who had been absorbed in his efforts to capture Corregidor after the fall of Bataan, claimed in his defense that he remained ignorant of the high death toll of the death march until two months after the event. Homma's verdict was predicated on respondeat superior but with the added liability standard, since the latter could not be rebutted. On February 26, 1946, he was sentenced to death by firing squad, and was executed on April 3, 1946, outside Manila. Masanobu Tsuji, who directly ordered the killing of POWs, fled to China from Thailand when the war ended to escape the British authorities. Also in Japan, Generals Hideki Tōjō (later Prime Minister), Kenji Doihara, Seishirō Itagaki, Heitarō Kimura, Iwane Matsui, and Akira Mutō, along with Baron Kōki Hirota, were found guilty and responsible for the maltreatment of American and Filipino POWs. They were executed by hanging at Sugamo Prison in Ikebukuro on December 23, 1948. Several others were sentenced to imprisonment between 7 and 22 years. 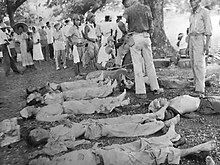 U.S. Army personnel toiled to identify the charred remains of Americans captured at Bataan and Corregidor and burned alive on Palawan. Picture shows charred remains being interred in grave. March 20, 1945. In 2012, film producer Jan Thompson created a film documentary about the Death March, POW camps, and Japanese hell ships titled Never the Same: The Prisoner-of-War Experience. The film reproduced scenes of the camps and ships showed drawings and writings of the prisoners, and featured Loretta Swit as the narrator. On September 13, 2010, Japanese Foreign Minister Katsuya Okada apologized to a group of six former American soldiers who had been held as prisoners of war by the Japanese, including 90-year-old Lester Tenney and Robert Rosendahl, both survivors of the Bataan Death March. The six, their families, and the families of two deceased soldiers were invited to visit Japan at the expense of the Japanese government. Dozens of memorials (including monuments, plaques, and schools) dedicated to the prisoners who died during the Bataan Death March exist across the United States and in the Philippines. A wide variety of commemorative events are held to honor the victims, including holidays, athletic events such as ultramarathons, and memorial ceremonies held at military cemeteries. On April 3, 2002, the memorial "Heroes of Bataan" was dedicated at Veteran's Park, Las Cruces, New Mexico. It depicts three soldiers assisting each other during the Bataan Death March. Two of the soldiers are modeled after the uncles of Las Cruces resident J. Joe Martinez, with the Filipino soldier modeled after a NCO stationed at WSMR (White Sands Missile Range) whose grandfather was killed during the March. Leading up to the statue is an area where footprints of survivors were cast in concrete. The Bataan Death March had a large impact on the U.S. state of New Mexico, given that many of the U.S. soldiers in Bataan were from New Mexico, specifically from the 200th/515th Coast Artillery of the National Guard. The New Mexico National Guard Bataan Memorial Museum is located in the Armory where the soldiers of the 200th and 515th were processed before their deployment to the Philippines in 1941. Every year, in early spring, the Bataan Memorial Death March, a 42.2 km (26.2 mi) march/run is conducted at White Sands Missile Range, New Mexico. On March 19, 2017, over 6,300 participants queued up at the starting line for the 28th annual event, breaking not only all previous records of attendance but also the amount of non-perishable food collected for local food pantries and overall charitable goods donated. Out of all the veterans from New Mexico that survived the Bataan Death March, only four are still alive today. As of 2012[update], there were fewer than 1,000 survivors of the March still living. The old state capitol building of New Mexico was renamed the Bataan Memorial Building and now houses several state government agency offices. ^ a b c d e Morton, Louis (1953). The Fall of the Philippines. US Army Center of Military History. ^ a b c Murphy, Kevin C. (2014). Inside the Bataan Death March: Defeat, Travail and Memory. Jefferson, North Carolina: McFarland. p. 328. ISBN 978-0786496815. ^ a b c d Esconde, Ernie B. (April 9, 2012). "WW2 historical markers remind Pinoys of Bataan's role on Day of Valor". GMA Network. Retrieved December 5, 2016. ^ a b c Woolfe, Jr., Raymond G. (2016). The Doomed Horse Soldiers of Bataan: The Incredible Stand of the 26th Cavalry. Rowman & Littlefield Publishers. p. 414. ISBN 978-1442245341. ^ Hubbard, Preston John (1990). Apocalypse Undone: My Survival of Japanese Imprisonment During World War II. Vanderbilt University Press. p. 87. ISBN 978-0-8265-1401-1. ^ Bilek, Anton (Tony) (2003). No Uncle Sam: The Forgotten of Bataan. Kent State University Press. p. 51. ISBN 978-0-87338-768-2. ^ Falk, Stanley L. (1962). Bataan: The March of Death. New York: W. W. Norton & Company. OCLC 1084550. ^ a b c d Greenberger, Robert (2009). The Bataan Death March: World War II Prisoners in the Pacific. Compass Point Books. p. 96. ISBN 978-0756540951. ^ "US-Japan Dialogue on POWs". www.us-japandialogueonpows.org. ^ a b Norman, Michael & Norman, Elizabeth (June 9, 2009). Tears in the Darkness (revised ed.). Farrar, Straus and Giroux. ISBN 978-0374272609. ^ Lansford, Tom (2001). "Bataan Death March". In Sandler, Stanley. World War II in the Pacific: an encyclopedia. Taylor & Francis. pp. 157–158. ISBN 978-0-8153-1883-5. ^ a b c d Lansford, Tom (2001). "Bataan Death March". In Sandler, Stanley. World War II in the Pacific: an encyclopedia. Taylor & Francis. pp. 159–60. ISBN 978-0-8153-1883-5. ^ a b Olson, John E. (1985). O'Donell: Andersonville of the Pacific. John E. Olson. ISBN 978-9996986208. ^ a b "Bataan Death March. Britannica Encyclopedia Online". Britannica.com. April 9, 1942. Retrieved December 17, 2012. ^ Greenberger, Robert (2009). The Bataan Death March: World War II Prisoners in the Pacific. p. 40. ^ Doyle, Robert C. (2010). The enemy in our hands: America's treatment of enemy prisoners of war from the Revolution to the War on Terror. University Press of Kentucky. p. xii. ISBN 978-0-8131-2589-3. ^ Hoyt, Eugene P. (2004). Bataan: a survivor's story. University of Oklahoma Press. p. 125. ISBN 978-0-8061-3582-3. ^ * Stewart, Sidney (1957). Give Us This Day (revised ed.). W. W. Norton & Company. ISBN 978-0-393-31921-7. ^ "O'Donnell Provost Marshal Report". www.mansell.com. ^ Downs, William David (2004). The Fighting Tigers: the untold stories behind the names on the Ouachita Baptist University WWII memorial. University of Arkansas Press. pp. 106–7. ISBN 978-0-9713470-5-2. ^ a b c "Bataan Death March". Interaksyon. April 8, 2012. Archived from the original on December 20, 2016. Retrieved December 5, 2016. ^ "Navy Transmitter Facility Capas Tarlac and Camp O'Donnell". navy-transmitter-facility-capas.com. ^ a b Ornauer, Dave (January 20, 2016). "American walks Bataan Death March to raise awareness of Philippine involvement". Stars & Stripes. Retrieved December 5, 2016. ^ "Bataan History". New Mexico Guard National Museum. Archived from the original on November 30, 2016. Retrieved December 5, 2016. ^ Herman, Arthur (2016). Douglas McArthur: American Warrior. Random House Publishing Group. ISBN 978-0812994896. ^ Horner, David Murray; Robert John O'Neill (2010). World War II: The Pacific. Rosen Publishing. ISBN 978-1435891333. ^ Darman, Peter (2012). Attack on Pearl Harbor: America Enters World War II. Rosen Publishing. ISBN 978-1448892334. ^ Friedland, Roger & Mohr, John (2004). Matters of culture: cultural sociology in practice. Cambridge University Press. p. 197. ISBN 978-0-521-79545-6. ^ McCoy, Melvin; Mellnik, S.M. ; Kelley, Welbourn (February 7, 1944). "Prisoners of Japan: Ten Americans Who Escaped Recently from the Philippines Report on the Atrocities Committed by the Japanese in Their Prisoner-War-Camps". LIFE. 16 (6): 26–31, 96–98, 105–106, 108, 111. ^ "LIFE". Time Inc. February 7, 1944 – via Google Books. ^ Jansen, Marius B. (2000). The Making of Modern Japan. p. 655. ^ Chappell, John David (1997). Before the bomb: how America approached the end of the Pacific War. University of Kentucky Press. p. 30. ISBN 978-0-8131-1987-8. ^ Toland, John (1970). The Rising Sun: The Decline and Fall of the Japanese Empire 1936–1945. New York: Random House. p. 300. ^ a b Sandler, Stanley, ed. (2001). "Homma Masaharu (1887–1946)". World War II in the Pacific: an encyclopedia. Taylor & Francis. p. 420. ISBN 978-0-8153-1883-5. ^ Maga, Timothy P. (2001). Judgment at Tokyo: the Japanese war crimes trials. University Press of Kentucky. p. 21. ISBN 978-0-8131-2177-2. ^ Solis, Gary D. (2010). The law of armed conflict: international humanitarian law in war. Cambridge University Press. p. 384. ISBN 978-0-521-87088-7. ^ "The Trial Of General Homma | AMERICAN HERITAGE". www.americanheritage.com. ^ Solis, Gary D. (2010). The law of armed conflict: international humanitarian law in war. Cambridge University Press. pp. 384, 385. ISBN 978-0-521-87088-7. ^ Brotman, Barbara (April 1, 2013). "From Death March to Hell Ships". Chicago Tribune. pp. Lifestyles. ^ Among others, additional narration was provided by Ed Asner, Alec Baldwin, Kathleen Turner, and Robert Wagner. "Never the Same: The Prisoner of War Experience". Gene Siskal Film Center. School of the Art Institute of Chicago. Archived from the original on March 28, 2014. ^ "Japanese/American POW Friendship Program". www.us-japandialogueonpows.org. 2010. ^ "Veterans Memorial Park – Live – City of Las Cruces". www.las-cruces.org. ^ Lauren E. Toney (March 24, 2012). "Bataan survivors attend rededication of monument Saturday". Las Cruces Sun-News. Archived from the original on March 14, 2013. Retrieved February 22, 2013. ^ "Timeline". Battle for Bataan!. New Mexico State University. Archived from the original on March 28, 2004. Retrieved February 23, 2013. ^ Phillips, R. Cody (2005). The Guide to U.S. Army Museums. Government Printing Office. p. 82. ISBN 9780160872822. Retrieved February 23, 2013. ^ "USA Marathons & Marathoners 2007". marathonguide.com. Retrieved May 8, 2008. ^ Schurtz, Christopher (March 22, 2010). "Record Number Gather To Honor Bataan Death March". Las Cruces Sun-News. p. 1. ^ Ramirez, Steve. "Early reviews favorable of Bataan Memorial Death March". www.abqjournal.com. Las Cruces Sun-News, N.M.
^ "History of Bataan Death March – New Mexico National Guard Museum". bataanmuseum.com. ^ Shofner was an American officer, captured on Corregidor, who escaped DaPeCol in 1943. Falk, Stanley L. (1962). Bataan: The March of Death. New York: W. W. Norton & Company. OCLC 1084550. Harrison, Thomas R. (1989). Survivor: Memoir of Defeat and Captivity – Bataan, 1942. Western Epics, Inc., Salt Lake City, Utah. ISBN 978-0916095291. Jackson, Charles; Norton, Bruce H. (2003). I Am Alive! : A United States Marine's Story of Survival in a World War II Japanese POW Camp. Presidio Press. ISBN 978-0345449115. Jansen, Marius B (2000). The Making of Modern Japan. Cambridge, MA: Harvard University Press. pp. 654–655. ISBN 978-0674003347. OCLC 44090600. Levering, Robert (1948). Horror trek; a true story of Bataan, the death march and three and one-half years in Japanese prison camps. Horstman Printing. ISBN 978-1258206307. OCLC 1168285. Lukacs, John D. (2010). Escape from Davao. New York: Simon & Schuster. ISBN 978-0743262781. OCLC 464593097. Machi, Mario (1994). Under the Rising Sun, Memories of a Japanese Prisoner of War. Wolfenden, USA. ISBN 978-0964252103. Masuda, Hiroshi (2012). MacArthur in Asia: The General and His Staff in the Philippines, Japan, and Korea. Ithaca, NY: Cornell University Press. ISBN 978-0801449390. Moody, Samuel B.; Allen, Maury (1961). Reprieve from Hell. New York: Pageant Press. OCLC 14924946. Morrow, Don; Moore, Kevin (2011). Forsaken Heroes of the Pacific War: One Man's True Story. Roanoke, VA: Wounded Warrior Project. ISBN 978-1565924796. OCLC 725827438. Murphy, Kevin C. (2012). "'Raw Individualists': American Soldiers on the Bataan Death March Reconsidered". War & Society. 31: 42–63. doi:10.1179/204243411X13201386799172. Murphy, Kevin C. (October 13, 2014). Inside the Bataan Death March: Defeat, Travail and Memory. McFarland. ISBN 978-0786496815. Olson, John E. (1985). O'Donell: Andersonville of the Pacific. John E. Olson. ISBN 978-9996986208. Norman, Michael & Norman, Elizabeth (June 9, 2009). Tears in the Darkness (revised ed.). Farrar, Straus and Giroux. ISBN 978-0374272609. Resa, Jolinda Bull (2011). Honor Them Always: For the Sacrifice of Their Youth at Bataan. Outskirts Press, Inc. ISBN 978-1432775551. OCLC 782073328. Sides, Hampton (2001). Ghost Soldiers. New York: Anchor Books. ISBN 978-1299076518. OCLC 842990576. Stephens, Harold (October 16, 1994). "Memories of the War". Humboldt Co., CA. : "Times-Standard," Sect. Style/potpourri. Stewart, Sidney (1957). Give Us This Day (revised ed.). W. W. Norton & Company. ISBN 978-0393319217. Tenney, Lester (2000). My Hitch in Hell. Brassey's. ISBN 978-1574882988. OCLC 557622115. Young, Donald J. (1992). The Battle of Bataan: A History of the 90 Day Siege and Eventual Surrender of 75,000 Filipino and United States Troops to the Japanese in World War. McFarland. ISBN 978-0899507576. Wikimedia Commons has media related to Bataan Death March. "Back to Bataan, A Survivor's Story" – A narrative recounting one soldier's journey through Bataan, the march, prison camp, Japan, and back home to the United States. Includes a map of the march. The Bataan Death March – Information, maps, and pictures on the march itself and in-depth information on Japanese POW camps. "Technical Sergeant Jim Brown U.S. Army Air Corps (ret) Bataan Death March Survivor Presentation to EAA Chapter 108 May 16, 2000"
1200 Days, A Bataan POW Survivor's Story A biography of Russell A. Grokett's survival of the Bataan Death March, including three years as a Japanese Prisoner of War.